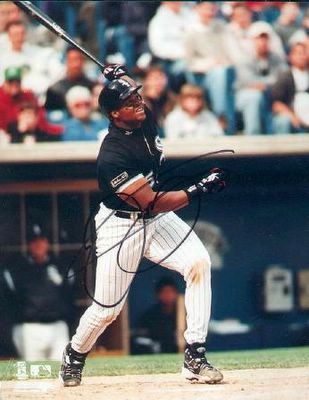 UPDATE: Due to Frank Thomas' recent retirement announcement, I've updated this article a little, here. B) if you could put current players in the Hall of Fame, who would get in? Naturally, they discussed several players from several sports, but one of the few baseball players mentioned was Frank Thomas, and Mike Greenberg contested that The Big Hurt should not get into Cooperstown right now. Despite having covered the Chicago sports beat during Thomas' best years in the early 1990's, and admitting that Thomas was putting up numbers comparable to Joe DiMaggio, Ted Williams, and Hank Greenberg, Mike Greenberg maintained that his drop-off after that removed him from the running. The 'Hurt' line is, of course, Frank Thomas' career to this point. The second line is that of the Splendid Splinter, Ted Williams, through his age 39 season, a comparable number of games to what Thomas has played so far, with an adjustment to put them on equal footing in terms of plate appearances. Are they the same? Of course not. Nobody was as good as Ted Williams, in his generation or any other, save perhaps Ruth and Bonds. But are they close? You're damn right they are. Williams had a few more of just about everything, but not a lot more of anything. He struck out a lot less, but so did everyone else at the time. Pitchers throw harder now, and relief pitchers are trained to get the strikeout, with Thomas having to face them much more often than Williams did. Joe Jackson, who's banned for life for a betting scandal, just like Pete Rose, or something. Mark McGwire and Barry Bonds, who aren't yet eligible, but who will be elected when their time comes, in all probability. ...and Pete Browning, who played almost half of his ~1200 game career in the 1880s American Association, beating up on sub-standard pitching while all the best players were in the National League. Walker and Helton are only on this list because they've played most or all of their careers in Colorado, and Walker is likely to drop off as he's now in the decline stage of his career, playing in St. Louis, and his career OBP stands at .401. Edgar Martinez, despite playing three more seasons than Thomas, played in only 120 more games, and did not hit for nearly as much power ("only" 309 homers). Ramirez, Jones and Abreu, all excellent players currently, aren't likely to improve upon their current career averages being already 30 or older, but are having Cooperstown worthy careers for now. So that's 14 Hall of Famers, one banned but otherwise Hall-worthy player, one potential Hall of Famer in Edgar, three guys who should be enshrined eventually if they follow normal career paths, and two guys who needed the help of the best hitting environment in major league history to get into this discussion at all. Pretty good company, I think. Overall, he's got to be one of the two dozen or so best hitters in history, and maybe only beneath Jimmy Foxx and Joe DiMaggio among right-handed hitters. Even without giving him credit for time he's spent injured, his numbers are already Hall-Worthy. With 3 or 4 more years, he's going to end up in the top 20-25 in homers, RBI and Extra-base hits, the top 50 in doubles and total bases, and perhaps the top 75 or so in runs scored. Bill James listed him as the tenth best firstbaseman ever back in the 2000 edition of his Historical Baseball Abstract, and since then he's had two and a half productive seasons, and one and a half seasons lost to injury. That still adds to his career value, in my mind. The radio host's contention was that because Thomas has been injured so much the last several years, and because he didn't maintain the pace he started in the early 1990s, and "didn't do anything in the playoffs", his Hall of Fame chances have passed. While certainly the first two of those things are true, should they really cause us not to vote for Thomas when he becomes eligible for Cooperstown? Thomas made five All-Star Games in that span, and won two MVP Awards, in 1993 and 1994. He's also finished in the top ten in the MVP voting six other times, and 15th one other time. Only ten players in history have amassed more MVP shares than Thomas, and they're all in the Hall, except Bonds, who's still playing. We hope. For that matter, 12 of the next 13 players on that list after Thomas are also in the Hall, and the 13th is Pete Rose. (I guess 13 isn't his lucky number.) Only three of the next 25 or so elligible players have not been elected, and Thomas is obviously far above them. In short, anyone considered so frequently and so seriously as the MVP of his league is by definition a Hall of Famer. It would be unfortunate if Thomas is unable to return to form in June or so, and even worse if he were unable to return at all. But if he weren't elected to the Hall of Fame when his time comes? That would really be a Big Hurt. "OK Alex Rodriguez, You Can Stay"
Alex Sanchez: Scapegoat or Closet Body-Builder?